Can’t wait for the weekend so you can stay up late and sleep in the next morning? Be warned — those extra minutes of slumber may come at a price, including a risk of weight gain, alcoholism and depression. 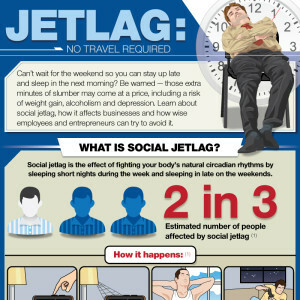 Learn about social jetlag, how it affects businesses and how wise employees and entrepreneurs can try to avoid it. You set an alarm on weekdays so you can get to work on time. Once the weekend comes, you don’t bother setting the alarm. On weekend days, you get out of bed whenever your body naturally wakes up. As a result, you get more sleep on your days off and your sleep schedule is probably closer to your body’s natural rhythms. 1 a.m. to 9 a.m. Many negative consequences can come from oversleeping on your days off. Work a schedule that aligns more naturally with your optimal sleep schedule. Go to bed earlier than you normally would on Friday or Saturday so you’ll feel better on Monday. Get elevated exposure to sunlight during waking hours. Avoid heavy sunlight in the hours before sleep. Don’t drink heavily close to bedtime. Have a dark and electronics-free bedroom.